Many of us were pleasantly surprised when, after a lot of work, and digging deep, the Huckabee campaign was able to raise more money on-line in the month of October as they had in the previous quarter. When the November goal was announced, I took a deep breath and figured that this time, Huck had bitten off a little more than he could chew. He wanted to double the previous efforts. $2,067,521. More than Two Meelyun Dollars! So, here we are on the last day of the month, and take a looksee……..Shows you how much I know, heh. I’m fixin’ to drop a $100 in Huck’s tip-jar. Let’s put him over the top! Join me, won’t you? Joe Biden, plagiarist, Senator, and would-be Democrat nominee for President, weighed in on the Iranian nuclear program (which, everyone knows, is designed for “peaceful purposes” ) in New Hampshire, yesterday ……. During an address to the Seacoast Media Group in New Hampshire on Thursday, the Delaware Senator said Bush has ‘no authority’ to unilaterally launch an attack against Iran. “If he does, as [Senate’s] Foreign Relations Committee chairman and former chairman of judiciary, I will move to impeach him,” he added. That constitutional support is pretty important. Especially since the House, not the Senate, is the Constitutionally authorized body to originate impeachment proceedings. At 28 N. Main, Rochester, NH, police are resonding to a hostage situation at Hillary Clinton’s campaign office. There are also reports of various bomb threats in and around Rochester. Mrs. Clinton is not in New Hampshire. She is attending the DNC Winter meeting in Virginia. FoxNews confirmed: “Something is going on…” Man claiming to have a bomb demanding to speak to Sen. Clinton…identified as Troy Stanley…Leland Isonberg. …”An armed man” took people hostage Friday at a Hillary Clinton presidential campaign office in New Hampshire, police said. 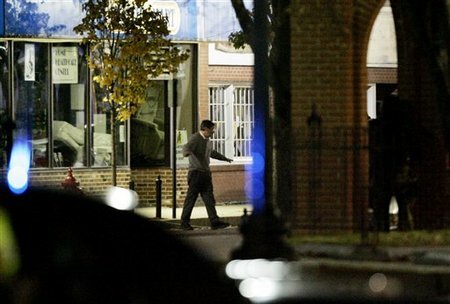 from WBZ … “We are trying to establish contact with the person inside,” Rochester Police Capt. Callahan told WBZ’s Joe Shortsleeve. He would not comment when asked if the man is armed and dangerous. Callahan said the neighborhood has been secured and they have re-directed trafffic. Our pal Mike, aka “The Coz” will be on the radio, this afternoon. He will be performing some of his original tunes, and talking about his faith. Should be interesting. Go here to listen, aprox 3P Central. This is the World Famous Friday Open Thread. Your thoughts and words are welcome here, as well as trackbacks, links, or whatever. Trackposted to Outside the Beltway, Right Truth, Cao’s Blog, Leaning Straight Up, The Amboy Times, The Bullwinkle Blog, Chuck Adkins, Pursuing Holiness, Adeline and Hazel, Diary of the Mad Pigeon, third world county, Allie is Wired, Woman Honor Thyself, Blue Star Chronicles, Pirate’s Cove, The Pink Flamingo, Right Voices, Church and State, and The Yankee Sailor, thanks to Linkfest Haven Deluxe.